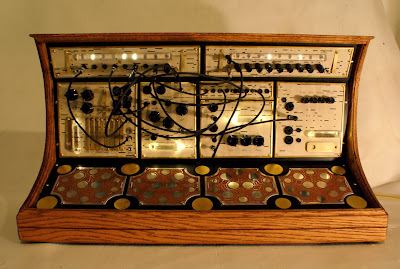 Easily my favorite folktek work. Truly a pleasure to play; an amazing expanse of sound and possibilities. The housing is made of oak and each panel is meticulously done in the style of the Impossible Box - labeled and framed is brass. The keys, lamps and switches for each panel are hand built and the provided cables are all cloth covered. 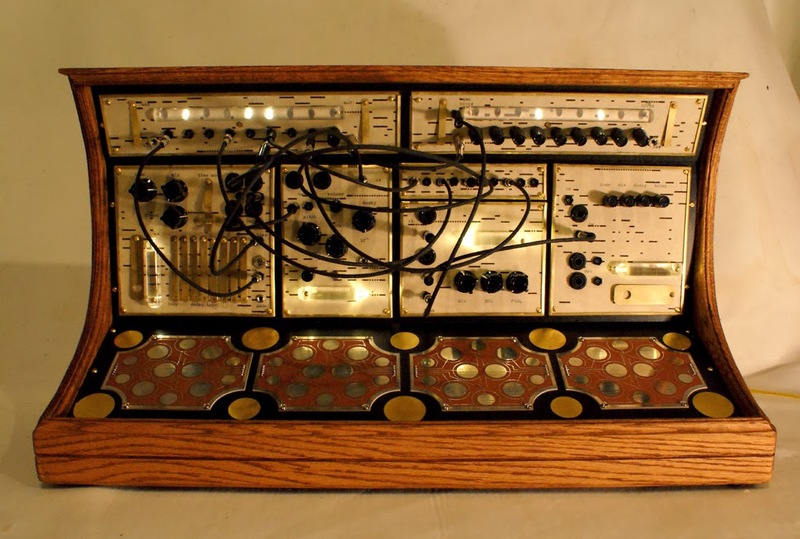 The Euphonos Field features touch based synthesis, synth trigger section, thick reverberation, filteration, delay and looping and two sequencers. All patching can be done on board with included patch cables and all modules have 1/4" ins and outs to send to/from external gear. The sound patching can be arranged however the player likes. ie; synthesis > reverb >delay/loop >filter. 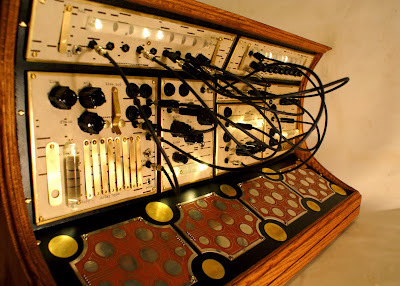 Each panel has Control Voltage to be accepted from the sequencers or from any external CV covering the synth pitch, synth triggering, filter frequency, on/off of reverb or delay, delay time and loop capture. 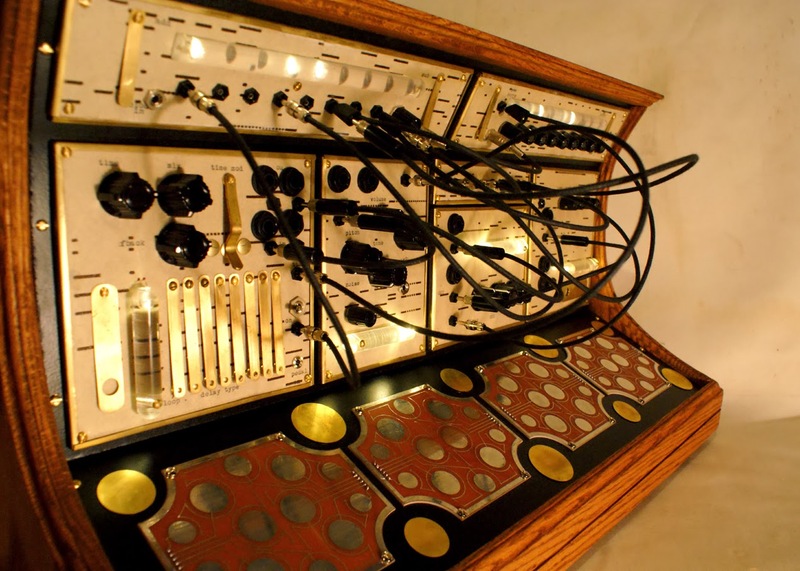 Loops can be captured in time with the sequencers (which can be synchronized to eachother optionally or synched to external clocks) and both the delay and reverb decay when turned off. At it's root is essentially an expanded Harmonic Field featuring 24 sweet sounding analog oscillators. The amp section controls filtering, overdrive, resonance etc. to shape the synthesis. 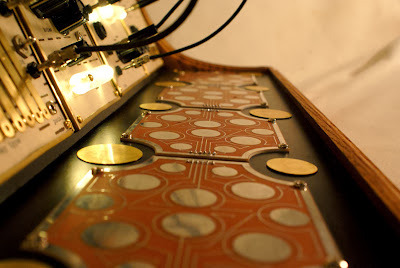 The sound can be further shaped with the addition of the synthesis panel which covers tonal control, noise, global pitch control, LFO clock out, decay levels and so on. 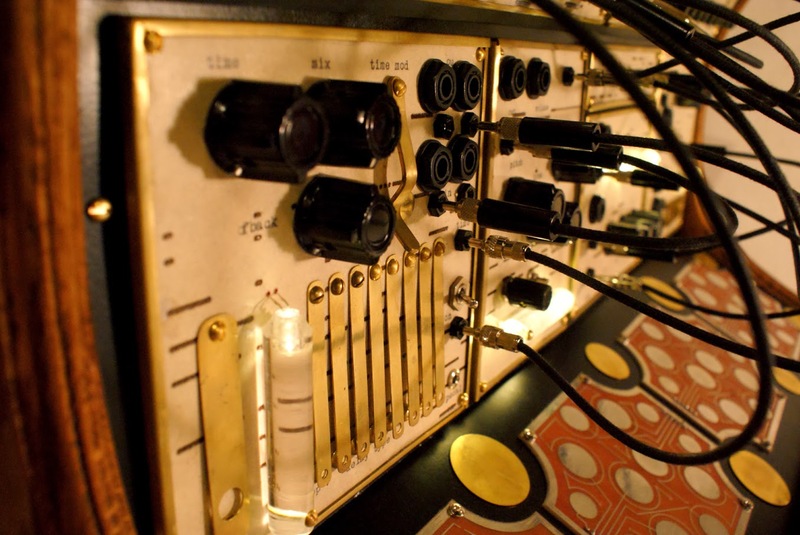 ten jacks to connect to any of the trigger sequencer parts; covering a range of notes from the decaying oscillators. a huge and rich sound with a long decay and tone control to get deep and dark with it. Naturally decaying when turned off and optionally cutting out the external sound (for use with the sequencer). simple but effective and nice sounding filter with controls over mix, resonance and frequency. Seven delay types, each accessed with the push of it's own key which is great for changing delay style quickly. The delay types are each very different from analog style to digital style with some panning and reverse in there as well. The delay time can be synchronized with the sequencer or tapped. The loop key activates loop mode which can be synchronized to turn on and off in time with the sequencer to capture loops up to about 35 seconds. Loops can be layered atop eachother with no limit on layering so long as the time limit is not met. The time modulation switch affects the time according to the incoming sound signal and has three modes . fast, slow and normal - creating a decaying chaotic oddity if desired. Two Independant 8 part sequencers with Clock in, clock out and the ability to add as many parts as you'd like or subtract them just the same. They can be synched together or to any external clock. One sequencer features knobs for independant step voltage levels to be sent to any or all of the CV inputs from the other sections. The other sequencer features a CV out for each part for triggering on/off messages for the other sections or the decaying synth part. In the end, the sound is however you like it to be, but also inherently beautiful. 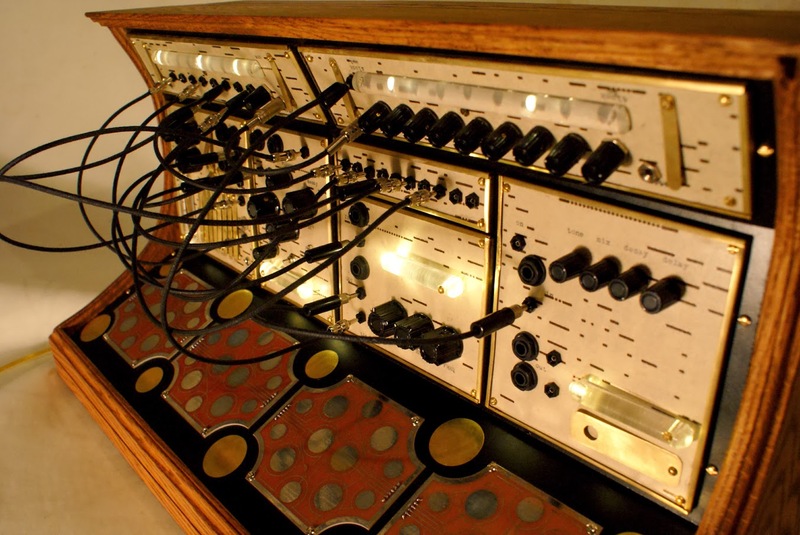 Because this array of oscillators are sent to ungrounded plates, a sweet, harmonic, ambient self oscillation is always present.